I am angry. India is angry. Very angry. And rightly so. All of us feel violated, helpless and frustrated. The Mumbai tragedy seems to be the last straw which has broken the camel’s back. Since 1998 India has had over 20,000 die in terrorist violence. We are only second to Iraq in this grim statistic and they are in a civil war. It is not only the audacity and the ruthlessness of the attack on India’s financial capital but that it has been preceded by 11 terrorist attacks in all our major cities (Ahmedabad, Jaipur, Hyderabad, Guwahati, Delhi, Mumbai, Bangalore, Gandhinagar, Varanasi and Malegaon) over the last seven years. Not to forget the outrageous attack in 2001 on the heart of our democracy— our Parliament. Our anger comes from the fact that despite all these attacks the Indian state has learnt nothing and we remain vulnerable as ever. It’s a complete failure of our political and bureaucratic classes. We have long been known as a soft state. We are not that alone. We are a rotten state whose insides have been pillaged by politicians and bureaucrats who masquerade as public servants. This country is still mired in poverty (according to the Government’s own report, 77 per cent live on less than Rs 20 per day), illiteracy and disease abound after 61 years of Independence. Now after six decades, the state cannot even perform its basic function of protecting its citizens, never mind giving them a better life. The socalled liberalisation which we have lauded so much since 1991 is nothing but the government loosening its stranglehold on us and letting our productive and creative energies flourish. No wonder the private sector in India is so dynamic but everything to do with the government turns into a kiss of death. It makes for unresponsive, lethargic and unreliable governance. We are a rotten state because corruption runs through the whole system. Politicians appoint bureaucrats and policemen who will curry favour with them and do their bidding. Merit is the last consideration. Critical equipment like Coast Guard ships, flak jackets, guns, ammunition are not purchased because someone’s palm is not greased or substandard equipment is bought because palms are greased. So when a constable’s antiquated gun jams when confronted with terrorists, no one is held accountable. Nobody of any seniority really gets punished. At worse, they could be transferred to await the return of a favourable political master to give them a plum posting. Members of Parliament get caught taking bribes and nothing happens. So, if this is the state of our higher echelons, we should be angry but we shouldn’t be surprised. Also, we shouldn’t be surprised by the brazenness of the terrorist attacks as terrorists see India as an impotent state. And they have reason to. Look at the milestones of our mentality towards terror. In November 1989, when Rubaiya Sayeed, daughter of Union home minister Mufti Mohammed Sayeed (during V.P. Singh’s premiership) was kidnapped in Srinagar, the terrorists asked for the release of five JKLF militants. The government of India succumbed and these militants were released. The other was, of course, the infamous IC-814 hijack in 1999 where external affairs minister Jaswant Singh personally delivered three terrorists in Afghanistan, including Maulana Masood Azhar who went back and set up Jaish-e-Mohammed, a terror organisation targeting India. Ironically, we are asking now for his return after the Mumbai attack. Two years later there was the shocking attack on Parliament where five terrorists almost entered the Parliament building. Fortunately, they were all gunned down; one surviving co-conspirator Afzal Guru who was convicted after three years and sentenced to death has now become a football for our votebank politics. His mercy petition remains in suspended animation. If you were a Pakistan general who wanted to destabilise India for strategic reasons and had plenty of jehadi cannon fodder amongst the multitude of terrorists outfits nurtured by the army, what would you do? You would keep coming up with one devious plan after another to upset your big neighbour whose economic progress you are envious of and whom you have not forgiven for breaking your country into two. Also, knowing fully well that India would not pick a full-scale war because of your possession of nuclear weapons. War cries are being heard but with two nuclearised nations that is hardly an option. War is only a means to end and the end can never be mutual destruction. I am reminded of a quote of my favourite speech, John F. Kennedy’s inaugural address in which he said: “So let us begin anew—remembering on both sides that civility is not a sign of weakness, and sincerity is always subject to proof. Let us never negotiate out of fear but never fear to negotiate.” Perhaps that is how we have to deal with Pakistan. So, what do we do? Give up hope on our failing leaders. No. We have the good fortune of being a democracy. Undoubtedly, it has its ills but public opinion is its lifeblood. For politicians, it is their oxygen. Since the Mumbai attack there has been a groundswell of public anger against their leaders. The people don’t want to be taken for granted. They want action. In the interest of getting action and building public opinion on a sustained basis, the India Today Group has pledged to use all its media platforms to keep this issue in the public consciousness till the Government delivers on its promises. For this, we have launched a movement titled ‘Declare War on Terror’ which is the subject of this special issue. In this issue, we begin by looking inwards. 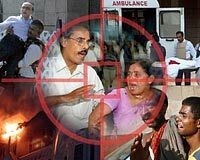 Despite repeated warnings from many sources that India could expect a terrorist attack from the sea, all information tragically and criminally went unheeded leading to the events of Mumbai. We ask how can our security networks be better prepared, better equipped and better run. We look at our international options and how to tackle the thorny issue of Pakistan, which may include diplomatic or even military options. We ask whether we need an international coalition to fight our war and assess the political and economic impact of the Mumbai attacks. We have invited leading national and international columnists to assess India’s options at this point in time and how we can learn from the experiences of other countries subjected to the scourge of modern terrorism. As part of our movement, we ask you to sign a pledge and return it with your ideas of how best we can fight the war on terror. We will be calling on leading experts on security, geopolitics and law, and seeking their views on the subject. We will then formulate the best plan for the situation that is decisive, effective and timebound, and take it up with the national leadership. Also, we will be starting a ‘Declare War on Terror’ forum under the aegis of our non-profit foundation CARE TODAY, which will carry on the movement even after the Mumbai terror attacks have vanished from the headlines. This forum will push for change in policy and law. It will study and present detailed proposals for upgradation of our anti-terror institutions. It will serve as a watchdog body to demand efficiency, governance and alertness from our civil administration. It will ensure that the heroes in this war are honoured. It will, through debate and discussion, try and build a national consensus on this issue. Above all, it will not allow the issue of terrorism to fade away from the public domain and the national agenda. We ask you to join this fight along with us. We believe that India can win this war against terrorism. Because we can. Because we must. At the height of World War II, Winston Churchill talked of the imperatives of victory. Today his eloquent words apply to India too: “Victory at all costs, victory in spite of all terror, victory however long and hard the road may be; for without victory there is no survival.” Let’s lead our leaders. And stay angry.